Hello all. As mentioned in our March newsletter, I did not desire to even entertain the thought of not having a conference this year, but unfortunately that is exactly what has occurred. The pre-attendance registrations were extremely low and even after reaching out to you, the homeschool community, there was a vastly minimal increase of registrations causing us to have to make this very big decision. There are many factors involved when planning a BIG event, obtaining a large location, putting a deposit towards event and the final preparations and costs of having the event, etc. So, with all these concerns of fees, penalties and loss of registrants all had to be taken into great account. It was a very difficult decision for the ENOCH Board to make, especially when for the very first time, in 30 years that we have had make the great decision of canceling our big annual conference. You may not be aware - ENOCH of NJ is a completely voluntary run organization, for the sole purpose of serving the homeschool community of NJ. We have been facing many big challenges and decisions in the last several years. Yet we been trusting God to again continue write the next chapter, and in making the decision on what role ENOCH will play in the future of NJ homeschoolers. We do know God is always in control! And all things do work out for good to those who love the Lord and are called according to His purposes. We covet your prayers for the continual guidance of our Lord in the future of ENOCH. On May 12, 2008, a 98 year old Catholic social worker named Irena Sendler died in Poland. Here is why her story is so important... and TRUE! During World War II, Irena, got permission to work in the Warsaw Ghetto, as a Plumbing/Sewer specialist. She had an ulterior motive... Being German, Sendler KNEW what the Nazi's plans were for the Jews. She convinced Jewish parents that their children were facing death either in the Ghetto or in concentration camps and offered to rescue them. She smuggled the children out of the Warsaw Ghetto and hid them in the homes of Poles, who adopted them, or in orphanages or convents. She smuggled infants out in the bottom of the tool box she carried, and smuggled larger kids in a Burlap sack. She also had a dog, in the back of her truck that she trained to bark when the Nazi soldiers let her in and out of the ghetto. The soldiers of course wanted nothing to do with the dog, and the barking covered up any noises the children might make. Irena made lists of the children's names and family connections and hid them in jars in her garden so that someday she could find the children and tell them who they were. Sendler was eventually discovered, arrested, and tortured (where they broke her arms and legs), and imprisoned by the Nazis. The Polish underground bribed a guard to let her escape and she spent the rest of the war in hiding. During her time and the course of this rescue mission, she managed to smuggle out and save the lives of Twenty Five Hundred (2500) infants and older kids. After the war, she tried to locate any of their parents who may have survived it all, and reunite the families. Most of the parents, however, had been eliminated in the famous gas chambers. Last year Irena was nominated for the Nobel Peace Prize. She lost to Al Gore, who won for a slide show on Global Warming. More: A teacher in a rural Kansas town discovered a short magazine article that claimed that a Polish woman saved 2,500 children from the Warsaw Ghetto in 1942 and 1943. He gave the story to four high school students and asked them to check it out. He said he'd never heard of the woman and speculated that the article may have gotten the facts wrong. The students looked into the story and discovered that Irena Sendler was real, her story was accurate. The students in Kansas developed a performance titled Life In a Jarthat tells the story of Irena Sendler. 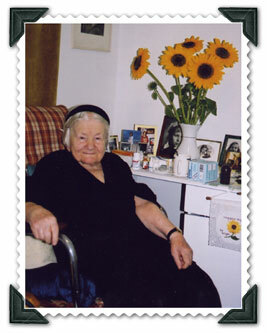 Those performances and the publicity that resulted have thrust the news about Irena Sendler around the world. Irena Sendler was not widely known until a series of events that started in Kansas, U.S.A., in 1999. Click here to see a website set up in her honor.